We are not doing Christmas cards this year, nor did we do them last year. Sorry to say, I had so many things going on, Christmas cards got pushed to the end of the line. However, I will probably be doing some sort of Valentine's/St. Patrick's Day/Easter cards, depending on the month I get to it, so never fear, I will send cards out...sometime next year. 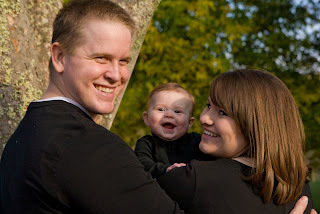 This picture is from our photoshoot with Ryan's Family, just after Thanksgiving. (thanks to Mom& Jen for making Zoe laugh) We will be heading to Oklahoma for Christmas again this year, in just a couple of days. Now we'll be on the same schedule with all the other siblings, so we will be all together next year. I'm just praying that the weather cooperates and we don't have delays getting there. We will be doing Christmas with Ryan's parents on Friday, so we'll see how Zoe reacts to presents. She has been very interested in the presents I have been wrapping for other people, but her only interest is chewing on the ribbon, or covering the paper in drool, I doubt she actually understands the concept of presents. I hope you all are having a wonderful holiday season. Ours has been busy, but very bright. Right now I'm getting in the spirit with Pandora, listening to 'Baby, it's cold outside." One of my favorite songs. I'll be wrapping up wrapping presents tonight, and then enjoying my clean house and maybe some sugar free fat free hot chocolate. Here's the recipe. XOXO, Holly & Co.
TOO CUTE! I love her big smile! So adorable! Hey I need your address, can you text it to me?